What better way to keep your crochet neat and tidy than in a granny square basket? Create just the basic shape or sew in a lining for added sturdiness. Find this project by Emma Varnam in issue 106 of Inside Crochet magazine, available to order online and download in a couple of clicks. 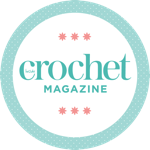 Emma has been designing stylish knitting and crochet patterns for over a decade. On her award-winning blog www.emma varnam.co.uk she features many of her free patterns and discusses the inspiration behind them. Find her on also on Twitter and Instagram @EmmaVarnamUK. Her book Granny Square Weekend was published this year by GMC Publications.